Need an epic way to close out your summer?! 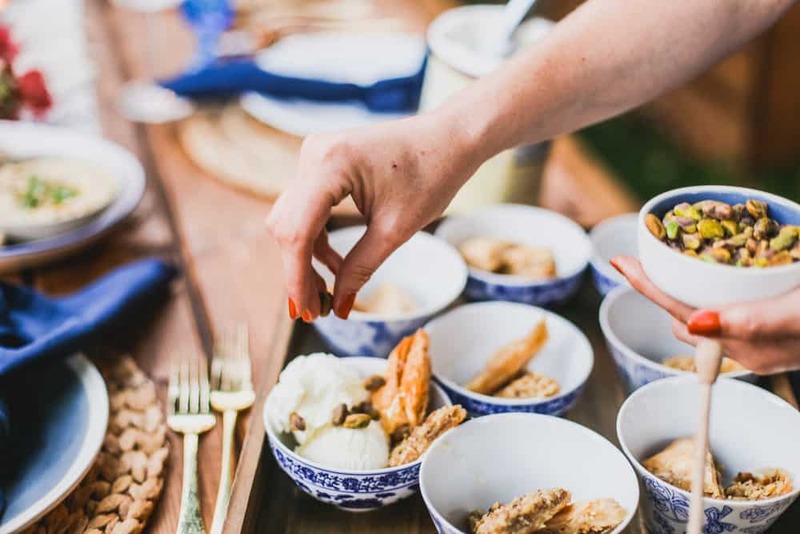 I’ve got you covered for everything you need to throw an unforgettable greek dinner party! No balloons, not too much fluff, just damn good food and a gorgeous table to celebrate the summer. 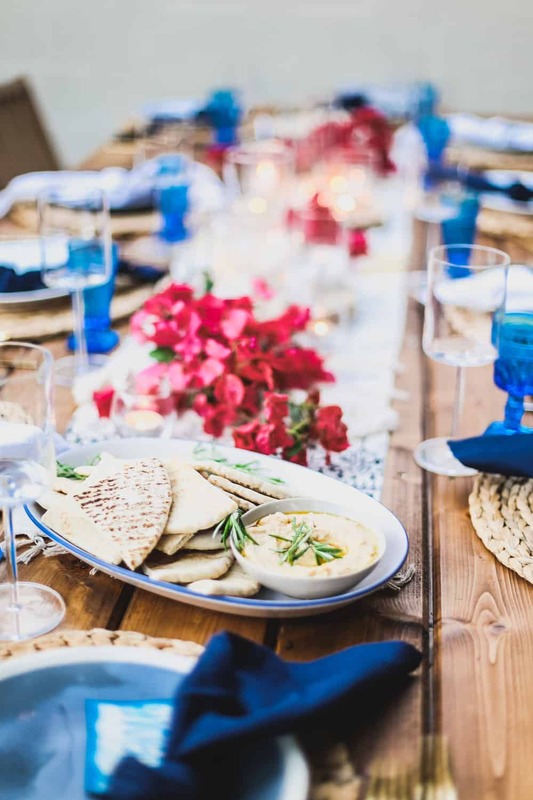 You can check out the greek dinner party tablescape details here! 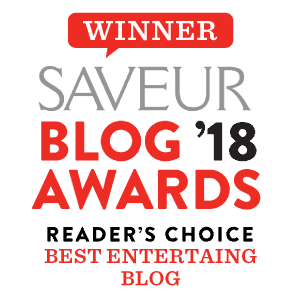 This whole party was inspired by this little greek restaurant that we frequent in old towne. This was hands down my favorite restaurant that we went to this summer. The flavors were light and aromatic. The last thing I want during a hot summer night is a dish that leaves me in a food coma (like this shepherds pie), I save that for the winter 😉 We would order lots of small bites and share a bottle of rose. It was basically summer date night perfection. 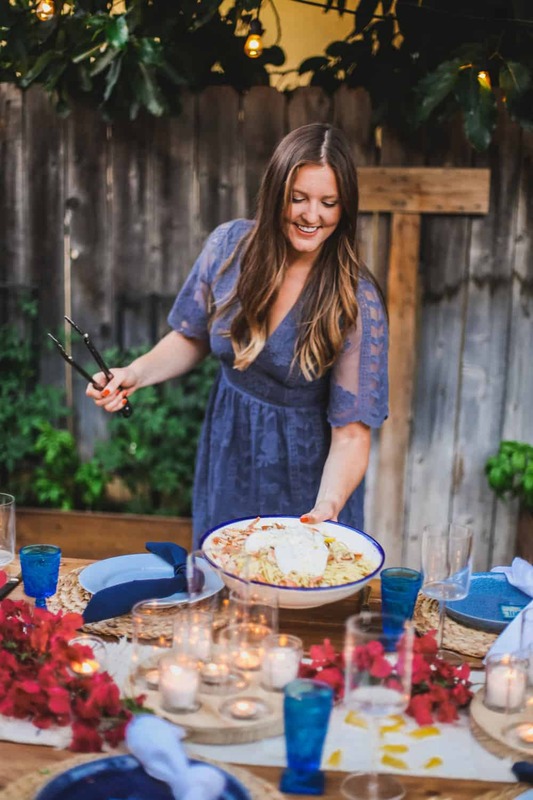 We had a pretty slow summer around here (mostly work, work and more work) and didn’t get to go on any elaborate vacations so I basically threw backyard dinner parties instead. Honestly, it was a nice alternative. 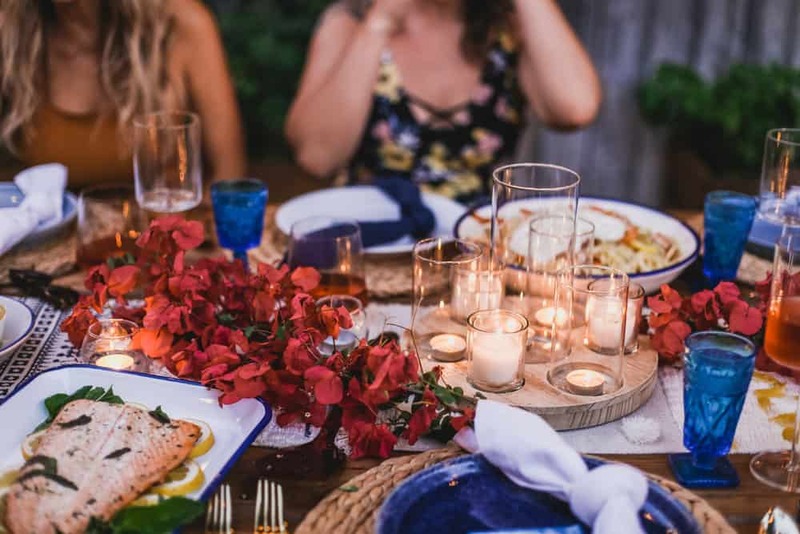 We did a different food theme for each dinner party to spice it up and give the evening a little bit more purpose. I’m all about a good theme or reason to bring everyone together. Even if it’s just a beer tasting party or to celebrate an exciting event in someones life. 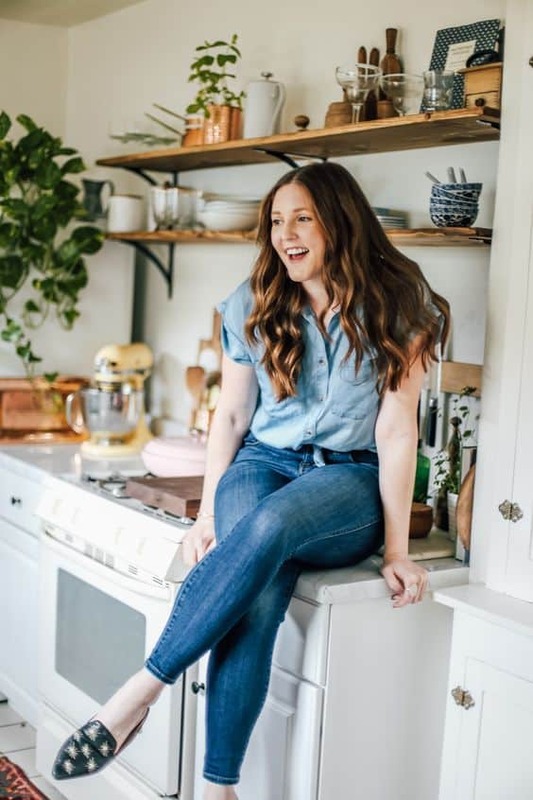 All the dishes featured in this dinner party are pretty simple and straightforward. I have alway said that a dinner party is probably not the best place to try out a new elaborate recipe. Keep it simple girlfriend, you’ll thank me later. 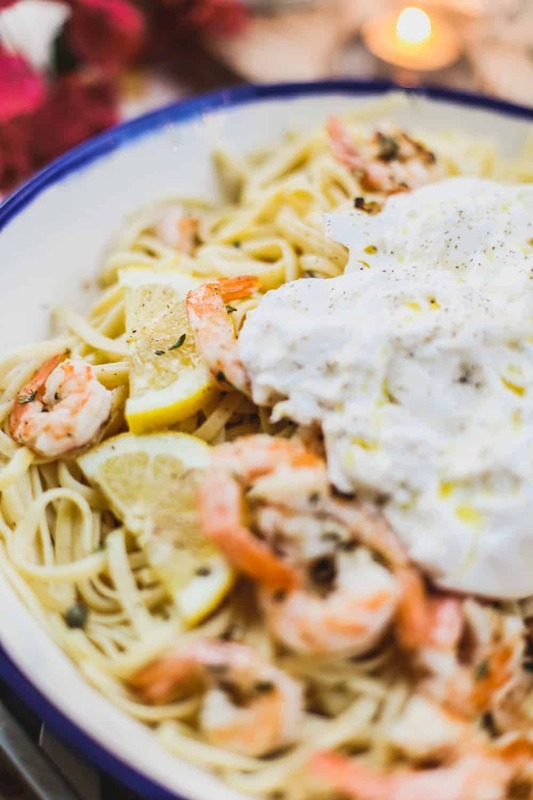 Scroll down to find easy make ahead, semi homemade and full-of-flavor greek inspired dishes! Start the night with an easy mezze board! 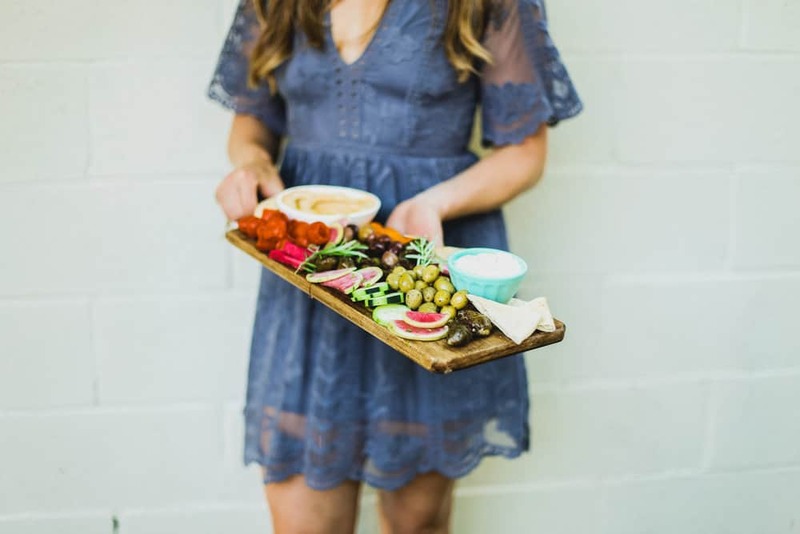 This colorful and flavorful mezze board will kick start your menu and introduce your friends into what kind of food they’re having! If you’re like me, and LOVE serving cheeseboards whenever you get the chance then break this out! A good rule of thumb is to pretty much clean out the whole olive bar at Whole Foods, just kiiiiiidding! But use that as a guideline! Plus, you won’t really have to ‘prepare’ anything, just assemble! 1. Grab a large serving platter or cheeseboard. Spread out 3-5 small bowls as your anchor for the board. 2. Vegetable selection: Keep it simple with marinated olives, peppers, radish slices, and cucumber wheels. 3. 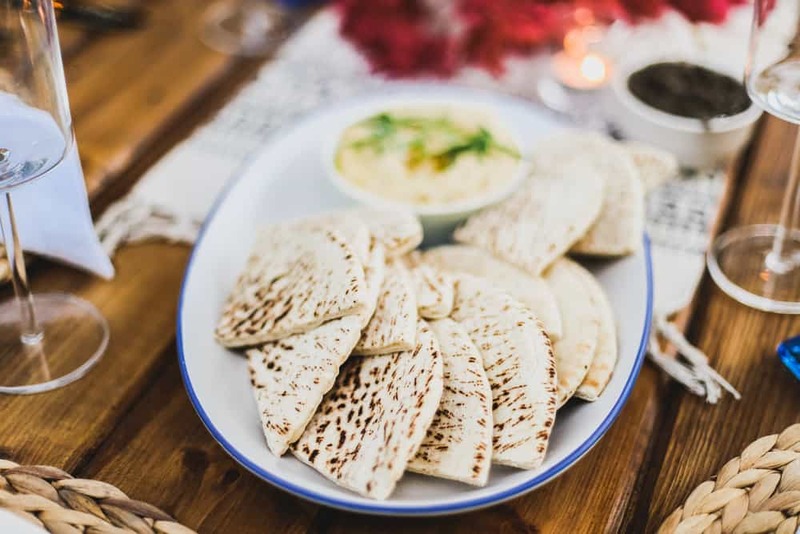 Breads and dippers: I swapped out crackers for pita slices! Trim up some bite size pita triangles and scatter them across the board. 4. 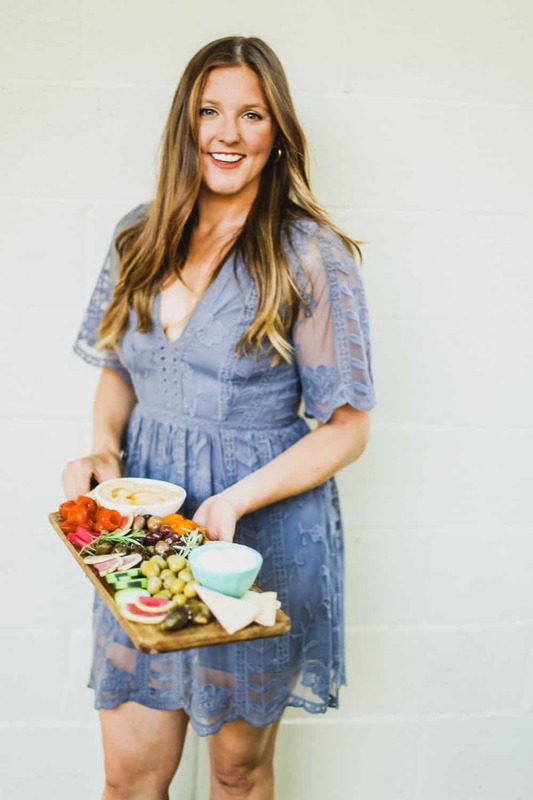 Dips: We filled the cheeseboard bowls with things like tzatziki and hummus. I won’t tell anyone if you buy them pre made, your secret is safe with me! 5. Extras: My salad bar at Whole Foods sells stuffed grape leaves and cous cous so I added them in for an extra bite. If you can’t get your hands on these you could do chunks of feta, figs or another vegetable! Don’t forget to garnish everything off with some fresh herbs. We used fresh Rosemary from my little herb garden. I love talking about my herb garden, it always makes me feel sophisticated like Ina Garten lolz. This really is as simple as it sounds. My friends love fresh (free) bread when we got out to eat so I always throw some kind of carbs in a basket on the table. To keep my ‘Greek’ theme running I put out two platters of hummus and pita triangles. Easy peasy. Plus, if you’re running late with dinner, this will buy you some time. You’re welcome. I used good old traditional hummus but feel free to put a few fun flavors out. Trader Joe’s has an epic hummus selection. AKA Poor Man’s Salad. My girlfriend Sierra was born in Italy and I always annoyingly ask her to flood me with as much Italian knowledge as possible because I’m so obsessed with the culture. I brought out this big platter of Panzanella at the dinner and she was like ‘Panzanella! (in her Italian twang!) and then told me it’s actually know as Poor Man’s Salad. 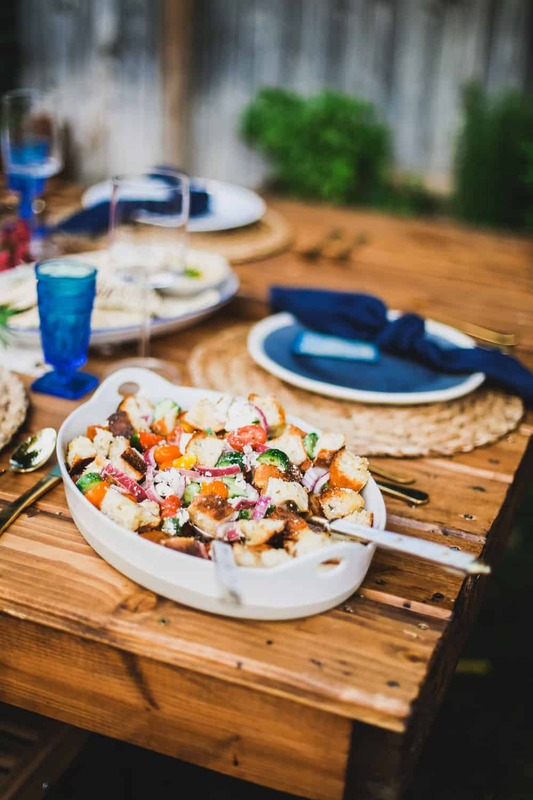 Here I am thinking Panzanella was sophisticated (and easy enough) for a Dinner Party. I still love panzanella and I’m always down with saving some denero. 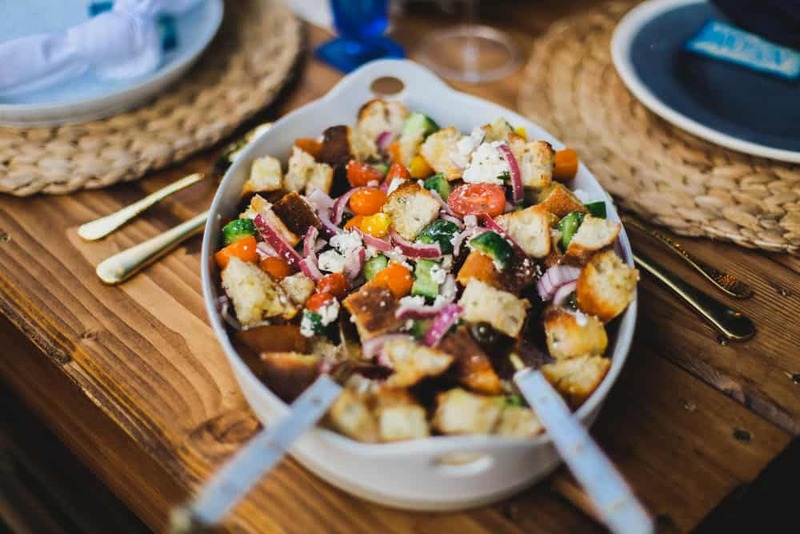 Basically I took the bones of a classic panzanella salad and added in some greek flavors. This is as simple as simple gets and you can make it ahead to save yourself some time, which means an extra glass of wine before dinner. Heck yes. 2. On a baking sheet spread ciabatta cubes and drizzle with olive oil. Toss together and sprinkle a few pinches of kosher salt and pepper. Bake for 12-15 minutes or until cubes are golden. 3. While bread is baking prepare dressing. In a mason jar with lid, add in all dressing ingredients and shake for 1-2 minutes or until dressing has emulsified. Store in refrigerator until ready to serve. 4. In an extra large bowl or platter toss together toasted bread cubes, tomatoes, english cucumbers, red onion and feta blocks. Drizzle dressing over salad 20-30 minutes before serving and toss well. The 30 minutes will help the bread soak up the flavor from the dressing. This linguini was the fan favorite of the night. I mean who can turn down something that is covered in two balls or burrata! Burrata is the cheese of summer for me. I try and literally sneak it onto everything. I asked my super talented chef friend, Billy, what would work nicely for a greek pasta dish and he told me to keep everything super simple! Flavors like fresh lemon juice, capers, and olive oil. Coming from an amazing chef, I was so happy he told me to keep it simple. Totally my motto when it comes to dinner party menus. 1. Bring a large stock pot of water to a rolling boil. Add in noodles and cook according to package directions (about 8 minutes or until al dente). Drain noodles and transfer to a large serving platter. 2. 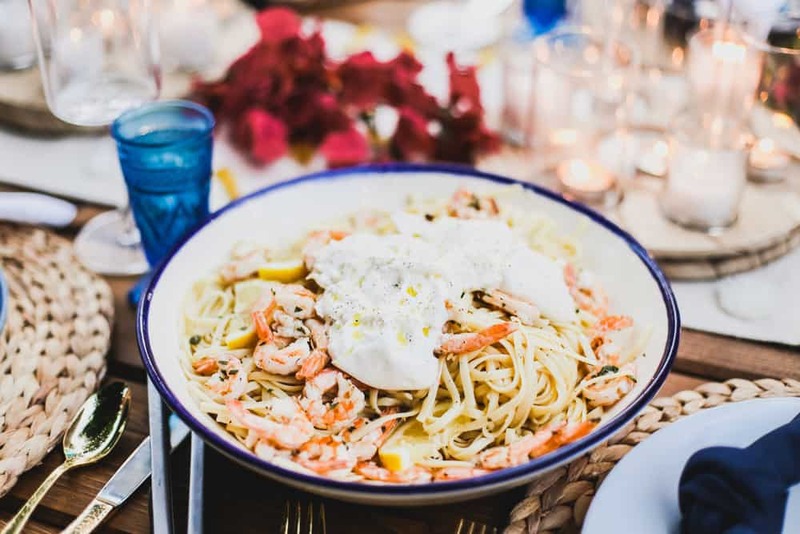 Toss linguini with olive oil, lemon juice, lemon zest, capers, rosemary and salt and pepper. 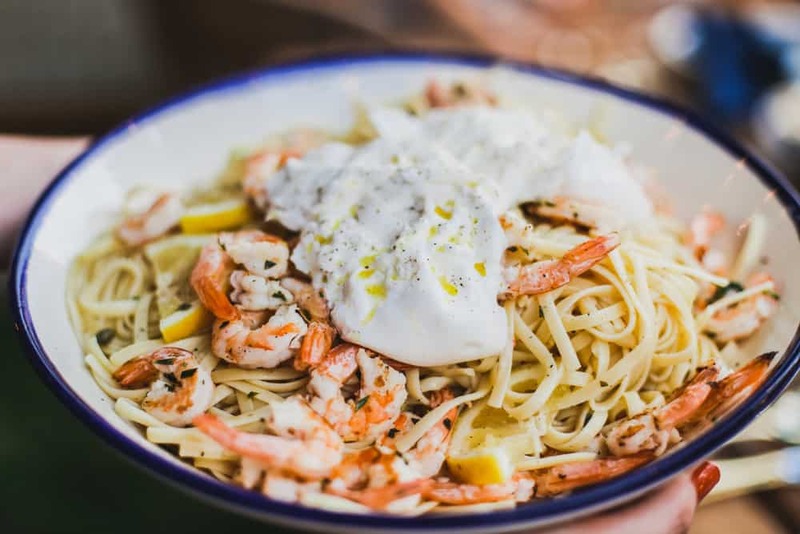 Top linguini off with two balls or burrata and shrimp (optional). I use a simple rosemary, lemon garlic marinade on EVERYTHING. Literally this is my go to marinade that works on practically every fish and poultry. I whipped up a triple batch for two large salmon filet’s and about 15 shrimp skewers. We bbq’ed the shrimp and oven baked the salmon. Jared was a little hesitant in his salmon filet grilling abilities so I went the oven route. The shrimp however, did great on the barbie! 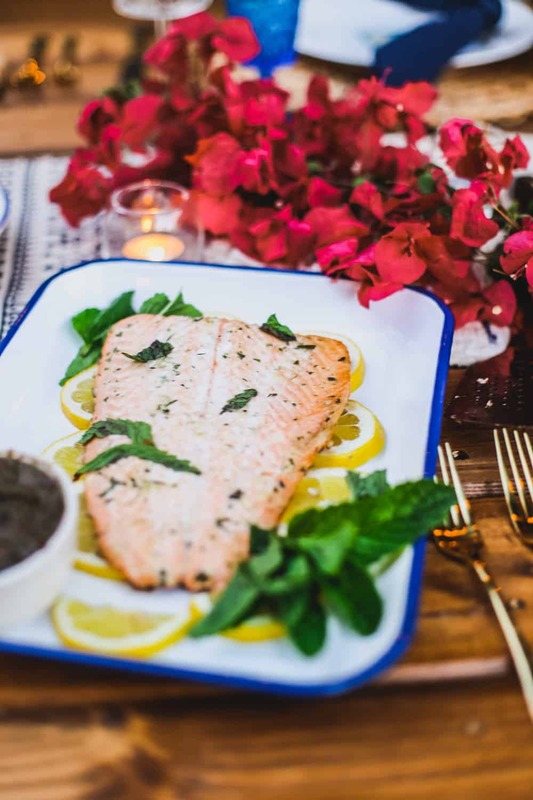 Serve up each protein on a bed of lemons for that ‘dinner party’ touch! 1. Whisk all ingredients together in a medium bowl. Divide evenly over salmon filets and shrimp pieces. 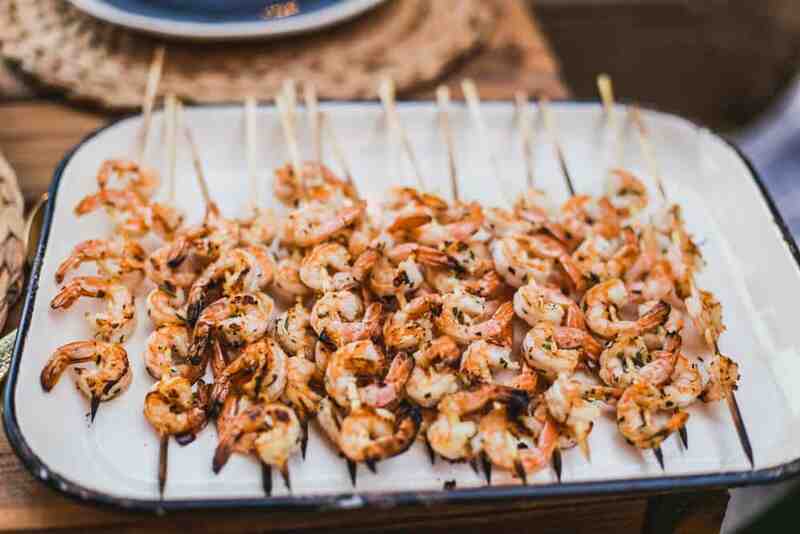 Marinate for 30-60 minutes and bake at 425 F for 15 minutes or grill each shrimp side for 3-4 minutes. Truth time: I get really lazy when it comes to dessert at dinner parties. At this point I have planned out a huge dinner and I usually run out of steam when it comes to dessert. Which really is such a travesty because it’s usually my favorite part to any meal! I keep things very ‘semi-homemade’ or ‘DIY’ at dinner parties for dessert. The little Greek restaurant that the whole dinner party was inspired by has the best effing baklava EVER. I couldn’t even attempt to make my own because I know it wouldn’t even come close to the Yaya that owns the restaurant. 1. 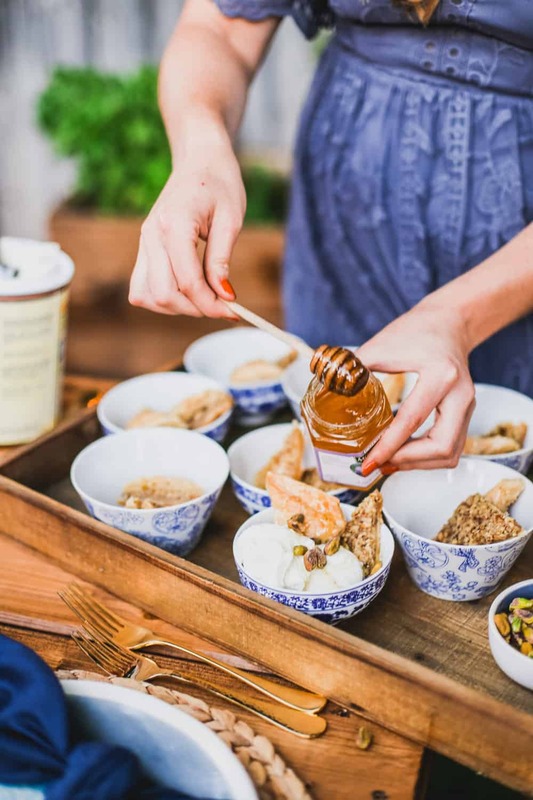 Layer each bowl with 2 triangles of baklava, a big scoop of vanilla ice cream, a generous drizzle of lavender honey and a small handful of pistachios.